Slaven Vlasic/Getty ImagesWPP Group CEO Sir Martin Sorrell visits Fox Business Network’s ‘Opening Bell’ at FOX Studios on May 15, 2015 in New York City. 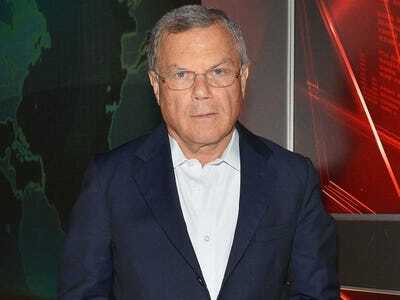 A third (33.45%) of advertising firm WPP’s shareholders voted against CEO Sir Martin Sorrell’s £70.4 million ($100.3 million) 2015 pay deal at the company’s annual general meetings in London on Wednesday. That was up from the 22% who voted against his £43 million ($66 million) compensation package the previous year. A shareholder revolt had been expected at the AGM, as a number of advisory firms lined up over the past few days to tell shareholders to vote against Sorrell’s pay deal, which was up nearly 64% on the previous year. His remuneration was devised from a long-term incentive plan (LEAP), where executives pledge their own equity, which 89% of shareholders voted in favour of in 2009. During that time, WPP says the company’s market capitalisation increased by over £10 billion and its shares rose 98%, while the FTSE 100 increased by only 5.8%. The LEAP scheme was replaced with a new scheme in 2013, which is expected to “substantially” lower Sorrell’s total compensation in future financial years. Essentially, the payout is based on a scheme shareholders approved that has taken five years to run out. Several WPP shareholders raised concerns about Sorrell’s compensation at the meeting on Wednesday. In other words, many WPP shareholders probably didn’t expect the company to perform as well as it did over the five-year period when they initially voted the policy in. Roberto Quarta, WPP chairman, added that remuneration decisions were not made in a “vacuum”. Despite these reassurances, a representative from charity ShareAction said this year’s LEAP package “goes a step too far”. The ShareAction representative said it would take someone on the national living wage 4,394 years to earn Sorrell’s salary. Sorrell later went on to explain that he reinvests a substantial amount of his earnings back into the company. There were also a number of questions from shareholders about WPP’s succession planning. Sorrell, who founded the company in 1984, is 71-years-old. Quarta said succession planning was a “work in process” and the board is continuously assessing both internal and external candidates.